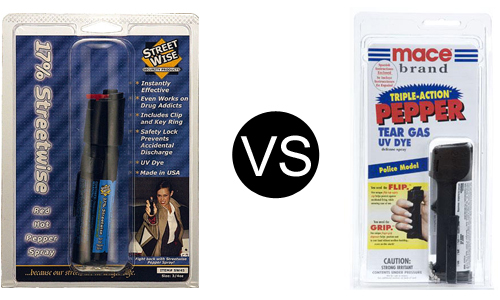 If you’re not sure what the differences between Mace, and pepper spray are, you’re not alone. Nowadays pepper spray and Mace are often used interchangeable; however, they are ultimately different substances. Below are differences to look out for which should help to determine which device is the best for your protection needs. Pepper spray is a blend of Oleoresin Capsicum, OC, and is a natural extract that is found in hot chilli peppers. It is this component that makes pepper spray an inflammatory agent which produces an intense burning sensation to the throat, skin and eyes, which consequently incapacitates anyone it makes contact with. What makes this device extremely potent is the fact that once its oily substance enters the pores on a person’s face it cannot be washed away which allows it to continue working for longer periods. Those unlucky enough to experience pepper spray will instantly induce choking, coughing, nausea, intense burning, temporary blindness as the eye vessels dilate, while the mucous membranes will expand so far by cutting off all but difficult breathing. Pepper spray has also been known to cause balance loss. The effects generally last anywhere from 15 minutes to over an hour. Mace is often regarded as a form of self defense spray, but in actual fact Mace is a registered brand name for ortho-chlorobenzalmalononitrile, or CN, and is a self defense company that sells pepper sprays as a form of protection. However, while pepper spray is an inflammatory agent that works deep, Mace is classified as an irritant and is comparable to tear gas and causes irritating to the mucous membranes located in the lungs, mouth, eyes and nose, produces coughing, sneezing, crying, pain in the eyes, temporary blindness and hard breathing. While it causes these irritations, it can also be easily washed away, thus reducing the effect it can produce. Furthermore, unlike pepper spray, Mace affects people differently, depending on their levels of pain management, and has been known to have no effect on those under the influence of drugs or alcohol. As a result of tear gas being a restricted substance in many states, the Mace brand is now solely pepper spray, although it is possible to locate different kinds of tear gas or tear gas combined with pepper spray under different brand names. For maximum employment of pepper spray it is best to aim for your attacker’s eyes, nose and mouth. These areas will soon be affected once the spray makes contact with them, as the classic effects include involuntary eye closing, headaches, coughing, inflammation, tearing, dizziness, mucous secretion, and chest tightness. When utilizing your pepper spray lock your arms straight out in front of you, grip the canister firmly in both hands and press down fully on the dispenser to project a quick burst of the spray in your attacker’s face. All pepper sprays are small enough to fit inside a purse or coat pocket, which means you can always have protection on when you require it. Not only that, but the use of pepper spray means that you don’t actually have to be close to your attacker in order to employ the device. Just as long as you are within 6 to 12 feet then the power in your little canister will be enough to stop anyone in their tracks. More distance equals more safety. Pepper spray functions by working deep in the pores on a person’s face. Its oily substance combined with its inflammatory agent means that it wears off slower than Mace, or tear gas, and causes lasting discomfort. Of course, when it comes to pepper spray and the Mace brand that is more than one option to choose from. Depending on your needs and requirement various formulas are available. Oleoresin capsicum is a natural extract that originates from hot chilli peppers. It is this extract the produces an intense burning sensation to the throat, eyes and skin when contact has been made. Tear gas is a lachrymator or lachrymatory agent which encourages the corneal nerves in the eyes to produce an intense burning sensation to the skin, tearing and shortness of breath. Familiar lachrymators feature CS tear gas (ortho-chlorobenzalmalononitrile) and CN tear gas (omega-chloroacetophenone). Ultraviolet (UV) dye is an added feature which marks your attacker, meaning that the chances of identifying and apprehending your assailant are much higher. Blended sprays combine CN tear gas, OC Pepper and UV dye. The benefit of utilizing the triple action formula is that you aren’t required to aim your attacker in the face; the tear gas itself that hits their chest will be sufficient to affect them. Animal sprays have been produced so that you have the necessary protection available to defend yourself against bears and dogs. While the sprays are the same employed on humans, the formula for the animal sprays has been created specifically for use against animals.